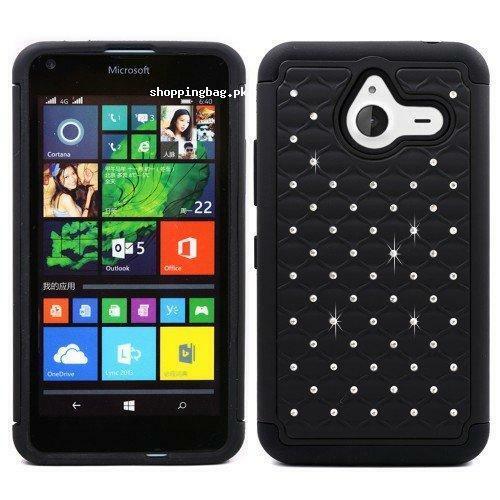 If you have Microsoft Lumia 640 XL phone and looking for nice, durable and luxury look mobile cover? Than this Microsoft Lumia 640 XL slim dual layer armor case is for you. This is best 2 in 1 hybrid case with spot diamonds on the external skin which give it luxury and bold look. This is one of the best efforts by Starshop dealing in Note 3 cases, LG Cases, Idol Cases, Galaxy Cases, iphone cases etc. Shoppingbag.pk will import this product directly from Amazon to make sure you can 100% original product. This hybrid 2-in-1 protective case is an ideal way to protect and keep your beloved device safe and looking good while providing you with the ultimate peace of mind. Designed to be form-fitting, durable and functional, it brings your device bold looks and protection to match. Brand new case with easy installation and multi-color available. Starshop Inc ship all orders out within 24 hours Monday to Friday (exclude weekends and Holidays). Only order from Star s Shop to get the 7 days money-back guarantee and 30 days warranty on all Starshop product.